Those who know me are well aware of my huge penchant for ice cream. I love it. I could eat in every night. I buy ice cream cones for home use and I am rather heavy-handed with the scooping. Once, I gave it up for lent just to prove to myself that I could. I have stories that revolve around ice cream. The only time I stole anything, for instance, it was–you guessed it–ice cream. (It was an innocent camp prank for which I came clean and apologized but, sadly, there was no ice cream to return.) You get the idea. In my younger years, I would eat an entire pint of Ben & Jerry’s from the container–in one sitting. Common sense and some restraint have prevailed in recent years, and I am continually experimenting with healthier creations that are cold, creamy, and equally satisfying. 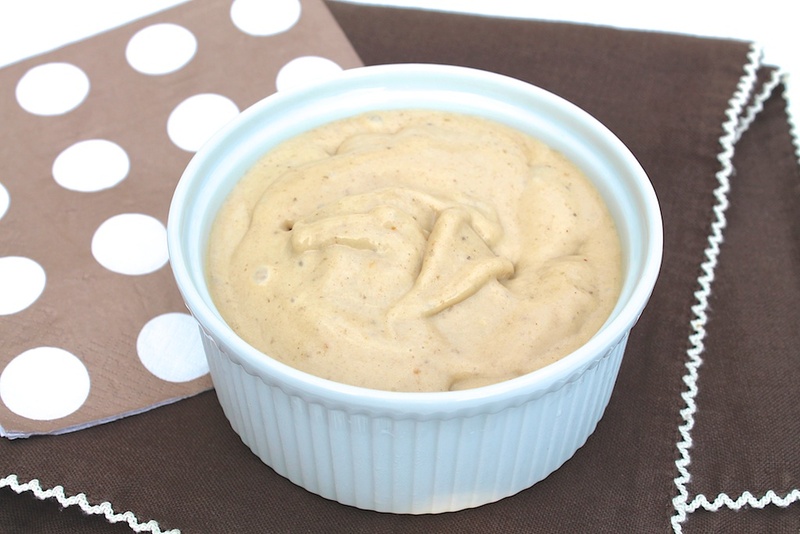 This recipe is my latest which uses frozen bananas as a creamy base. The finished product is a delightful, soft-serve consistency. I love the creaminess. After a few hours in the freezer, it will freeze hard like regular ice cream. I like to let it sit at room temperature for a few minutes to become easily scoop-able, but you may certainly eat it right away. So choose the option based on whether you prefer your ice cream hard packed or creamy…anyone else like it a little soupy, like me? This began as a recipe using a homemade honey peanut butter. 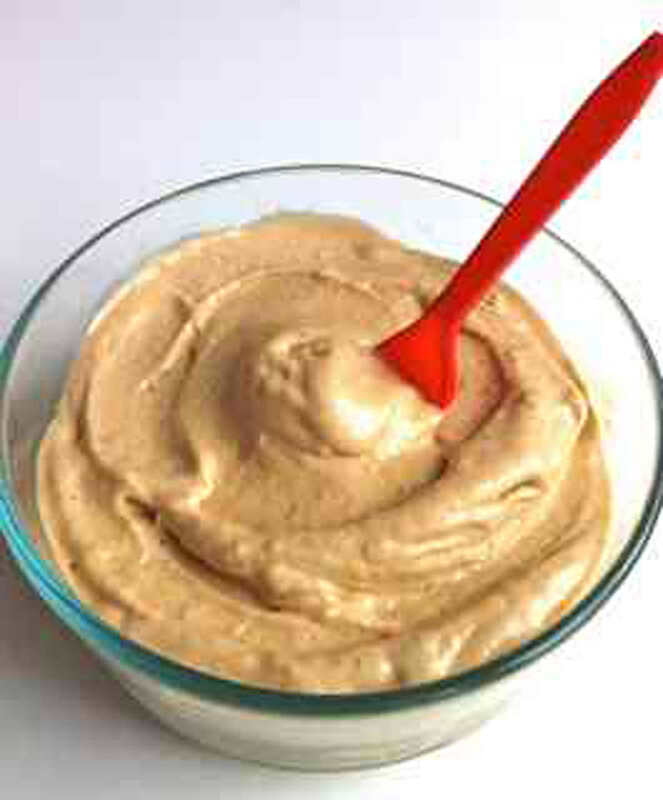 More commonly now, I make it with plain, natural peanut butter and add the honey separately, as noted. Either way, it is a treat! Enjoy immediately as you would soft serve ice cream or store in freezer. This will freeze hard like regular ice cream. When I make extra to store in the freezer, I let it sit at room temperature a few minutes to soften before serving. The mixture will become creamy, but if you have trouble waiting, you may slowly drizzle milk through the feed chute until a smooth and creamy consistency is achieved. I used to always do this–no more than a few tablespoons–although now I keep processing, stopping to stir the bananas and scrape down the sides occasionally, until the magical moment when it all comes together as “ice cream”! You could have been describing me in talking about your love of ice cream. And I make banana “ice cream” or cocoa banana smoothies to keep myself from eating ice cream EVERY night! It is so nice to have a partner in crime in the ice cream department: ) I’ll have to share my chocolate smoothie with you, too. It’s a constant search for worthy substitutions! Adore your page! I love to cook, bake etc and have earned my living many times doing so. Your story on ice-cream brought me back to my childhood days and I wish to share it with you. My first real scare and a visit to the police station involved ice-cream! In my Yorkshire village one day an ice-cream van was parked but the driver hadn’t closed the service window. I couldn’t resist, my small 7 yr old frame made it half way over the counter as I eagerly attempted to have a few licks of what I could see. Suddenly I was in the air, the driver took me by the pants to the cop station around the corner, there I learned what I already knew “thou shalt not steal”!! At the age of ten my Father decided he would rent a Mr. Softee van on weekends and took me with him to learn the trade. I made the most beautiful soft served cones & sundaes in the UK…I thought…an expert! While my Dad drove from one village to the next, I made myself the most elaborate sundaes imaginable, and figured I had earned it as I was only paid a few shillings for a whole days work! Those days were the most cherished days of my life and 50 years later my love for ice cream still remains. My favourite funnily enough, is peanut butter/choc chip! I loooooove ice cream but now that I’m diabetic my options are very limited. Not too many flavors in the “No Sugar Added” section. This sounds awesome! I think I would put chopped peanuts in this for some crunch! One thing (I hate to be petty) but I just wanted to point out that you have a “penchant” for ice cream (as do I) not a pension (which means you could look forward to a retirement full of ice cream, lol. Not a bad deal either way). I had to look it up in the dictionary myself to be sure. I am also a diabetic with a “forbidden” passion for ice cream. Our Walmart has Blue Bunny fat free, no sugar added ice cream! Only found two flavors so far, but at least it is something! Can’t wait to try limited portions of your Banana chocolate peanut butter! I hope this satisfies, Sharon! Thank you for your comment. I would love to know how it compares! Great question, Shelley. I go in spurts where I use my food processor a lot, and then not much for a time. That said, it can be an invaluable tool for which there isn’t always a good substitute. (I have been making a lot of this treat lately, so it is getting a lot of action!) For years, I had my grandmother’s old Cuisinart. It was so old but still worked beautifully. Eventually, I broke it (my fault) and replaced it with another Cuisinart based on the longevity of my first one. A couple features I like are the bigger prep bowl and the extra blades for shredding. That one comes in handy if you like to make zucchini bread, carrot cake or muffins, etc. Hope this helps!